At 8AM we were out and on the road from Kenmore to Oban to catch the noon ferry to Isle of Mull. The entire drive was gloomy with pouring rain, which had fortunately stopped by the time we reached Oban. With our van at the front of the line, we had over an hour to wander around Oban and pick up some lunch to eat before cycling the Isle of Mull. 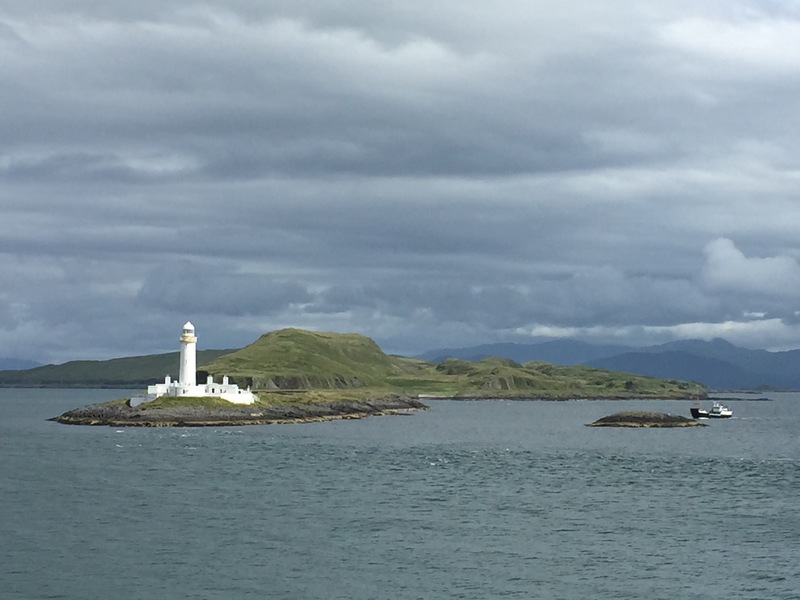 The sun started to break through the clouds while we were on the ferry, giving us some gorgeous views of the Eilean Musdile lighthouse (above) and of Duart Castle, our next stop. Once we arrived in Craignure, we hopped on a tour bus for the short ride to the castle. 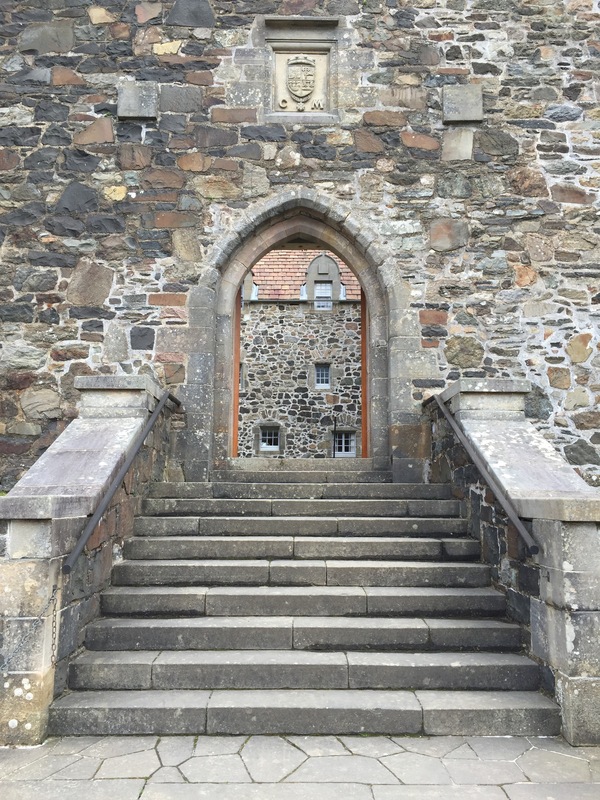 Exploring Duart Castle is like leafing through the extensive Maclean family photo album – there were paintings, photos, clothing, stories and mock-ups of what life was like in the castle at various points in its nearly 650 year history. The current clan chief is likely living in a home with many more modern comforts. Still, it is great to see the clan’s family pride and the setting for the castle on the cliffs with sweeping views of the straight is impressive. The sun was shining by the time we were ready to leave Duart Castle and begin our ride through Isle of Mull. 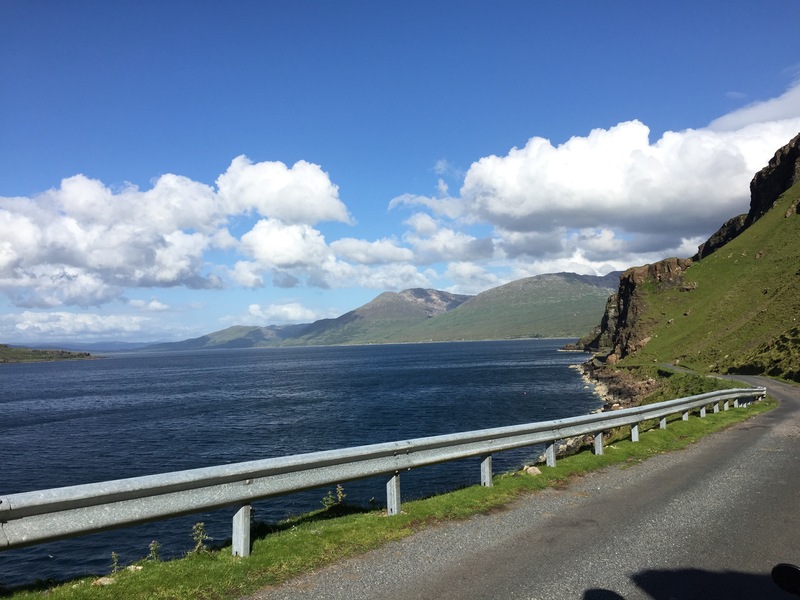 Because the forecast was for a rare sunny and warm afternoon, our tour guides made a change to the original itinerary so we would have the opportunity to cycle along Loch Na Keal in glorious weather. 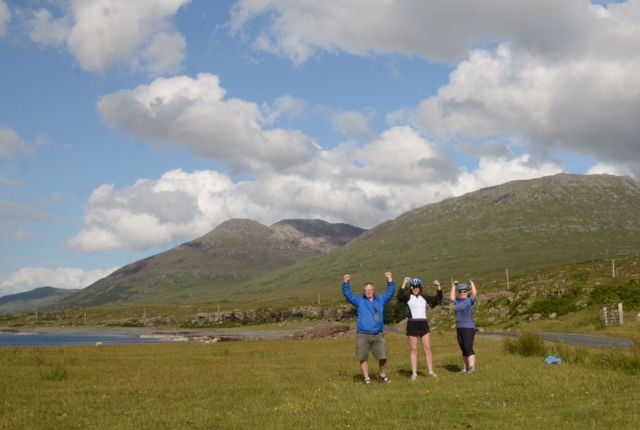 Once we were clear on the revised directions we set off on our tour of Mull. We first cycled from Duart Castle to Salen, stopping to find a buried knight in an old coastal cemetery. After a short break to refuel with a Scottish flapjack at The Coffee Pot in Salen, we turned inland to cross over to Loch Na Keal. From this point on we cycled entirely along single track roads with passing spots at various intervals where drivers wait for cars coming from the opposite direction to pass. As a result, driving and cycling in this area is a bit of a waltz with one side, then the other, swinging into a passing spot trying not to meet in the stretch between. If cars happen to meet in between the passing spots, negotiations begin – either trying to squeeze past each other or one car backing up until the other one can pass. Then there are the sheep. Unlike other areas of Scotland, the sheep are not fenced in, so we would often come around a bend along Loch Na Keal and find sheep wandering up the road, looking for a new spot to graze. The southern coastline of Loch Na Keal is spectacular! With soaring cliffs above us, winding roads, sparking water, blue skies, grazing sheep, and the occasional boat, I had to resist the urge to take a photo at nearly every bend. It was my favorite stretch to cycle in the entire tour. Just so we could cycle as long as we possibly could, we volunteered to be the last to be picked up for the drive to Tobermory. Eventually we hit strong head winds as the road turned toward the mountains, so we turned back to Salen. One constant of cycling: the wind will change with the direction of your bike. As soon as we turned around, the wind changed direction so we were cycling into head winds until we got into the valley between the loch and Salen. Still, with the gorgeous scenery distracting us along the way, it was worth it! We arrived in Salen half an hour ahead of schedule. Instead of tackling the serious hills to Tobermory, we waited outside The Coffee Pot for the van. We arrived in Tobermory at 8PM, where we stayed at the Western Isles Hotel with gorgeous views of the harbour and bay.